Athletics is an integral part of the overall educational experience at The Westfield School. Even though success is measured on a scoreboard, the belief at Westfield is many life lessons can be learned through athletic competition. Sportsmanship, leadership, camaraderie, hard work, time management, moral character, self-discipline, and Christian values are valuable lessons taught within the athletic experience at Westfield. Westfield is an interscholastic member of the Georgia Independent School Association (GISA) and competes in its highest classification. Westfield students participate in 13 different sports and field teams at the varsity, junior varsity, and middle school levels. Westfield also offers football and cheerleading at the youth level. Bruce Lane has been hired as Head Football Coach at The Westfield School. He will begin his job on June 1, 2019. Coach Lane has served as Head Coach at Augusta Christian School in Augusta, Georgia, where he led the team to a state championship. He also served as head coach at Wilson Hall School in Sumter, South Carolina, where he led the team to a state championship. 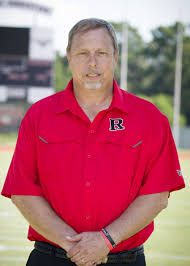 Currently, Coach Lane is working as head coach at Rosehill Christian School near Houston, Texas. He was a finalist for the 2018 Coach of the Year Award by the Houston Touchdown Club.